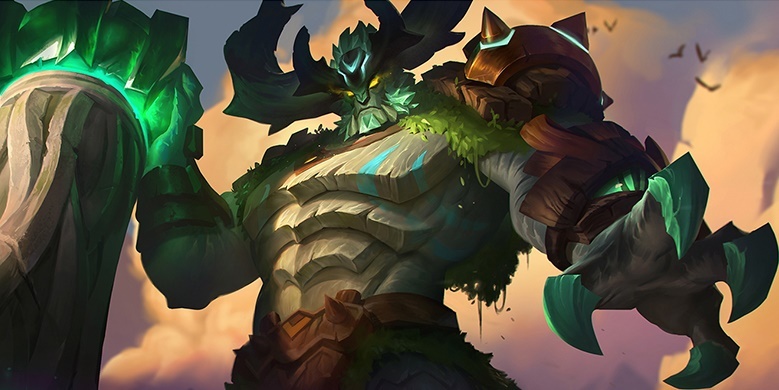 A guide to Arena of Valor's Baldum, the Monolith. Baldum is a tank flexible enough to either support his team or duel alone. His Wild Charge and Wild Prison are excellent tools to divide and conquer the enemy team, while Wild Stomp pulses damage and keeps him alive in fights. Baldum is a support tank with reasonable brawling capabilities and the ability to separate and pick off stragglers on the enemy team. Though he has a clear weakness against long-ranged heroes, his armor-damage scaling and Wild Stomp can keep him alive for extended periods in team fights. Abilities scale with armor – Baldum is the first hero whose abilities deal more damage the more armor he accumulates. Combined with a passive that grants him additional bonus armor, Baldum is able to dish out decent damage while being extremely tanky. Good Crowd Control – Wild Charge is great for picking off heroes who are out of position as well as peeling for assassins who dive your back line. Wild Stomp, while somewhat short range and just an okay slow, is a very spammable ability. Finally, Wild Prison can either set up wombo-combos or split up a team, allowing your team to pick stragglers off. Versatile Role – Baldum can support an ADC in the Abyssal Lane or capably solo in the Dark Slayer lane. For the former, Wild Charge can set up kills for your teammate(s), while for the latter, Wild Stomp helps mitigate the damage of bursty DS-laners like Ryoma. Weak versus long-range heroes – Though Baldum can occasionally catch a marksman or mage with Wild Charge, adept players can abuse its range and long cooldown. In addition, tanks can position themselves in front of their backline, effectively protecting them from the charge as Baldum flips the first hero he comes in contact with. Unwieldy, hard-to-use ultimate – At first glance, Wild Prison seems like a great set up for a wombo-combo, or a way to split up the enemy team. However, the cast time is extremely long, and gets even longer when used at maximum range because there’s an additional travel time. In addition, the cast area is relatively small, meaning mobile heroes who see the circle can escape even if you aim at them dead-center. Finally, Wild Prison makes enemies temporarily immune to damage, meaning you’ll often end up accidentally saving a hero that you were intending to catch. In the Dark Slayer lane, use Wild Stomp on the opposing hero as often as possible – this is particularly important when dealing with high-damage DS laners like Ryoma. Only use Wild Charge on minions if you are desperate to clear it as quickly as possible and you are certain that no heroes are around. From level 3 on, both Wild Charge and Wild Stomp receive double benefits from leveling – the former via damage and CDR and the latter with damage and damage reduction. Though we recommend leveling Wild Charge, it’s close enough that your personal play style and/or the opposing team composition make the decision flexible. As always, upgrade Wild Prison right at 4, 8, and 12, as the cooldown and additional damage make it worth your while. Note that Wild Stomp will only reduce physical damage, so you’ll need to be more cautious with heroes like Arum and Xeniel. Team Battle: Before the battle starts, identify whether you’ll need to engage or peel for your back line, as Wild Charge is needed for either responsibility. Baldum is particularly adept at peeling for squishy teammates, as Wild Charge physically pulls pesky assassins away and slows them, and Wild Stomp keeps them away while your damage dealer (hopefully) retaliates. Otherwise, get in the middle of the opposing team and use Wild Stomp on as many heroes as possible. As long as your team is nearby, taking the brunt of damage and even dying is okay, as the time it takes to kill you will likely be more than enough for your team to counter-wipe the enemies. As for Wild Prison, use it on a clump of heroes if the opportunity is available. Otherwise, identify the least mobile hero and aim for them as the fight breaks out, giving your team a temporary numbers advantage. If you’re having trouble landing Wild Prison, try aiming it at your feet, as the cast time will shorten and the melee heroes attacking you will likely not notice quickly enough to dodge. Wild Prison is particularly useful for nullifying particularly powerful ultimate abilities like Rourke‘s Determination. Escaping the Battle: Wild Charge is Baldum’s standard escape tool. If possible, try to avoid hitting a hero if your plan is to escape, as it will reduce the length of the charge. Wild Stomp doesn’t require any cast time or animation, so use it to slow pursuers whenever possible. Wild Prison can be used as a last resort if there’s no other way to escape – aim it at your feet or in your escape path to account for the long cast time. Hulking – Passive – Baldum’s physique grants him 18% bonus armor. His normal attacks deal an additional 20 (+1 for every level) magic damage. Wild Charge – Baldum dashes forward a short distance, dealing 175/225/275/325/375/425 (+0.5 AD)(+0.3 armor) physical damage to enemies along the way. He stops when he runs into an enemy hero, then swings his totem and tosses the hero behind him, dealing additional physical damage equal to 8% of the target’s maximum HP and slowing the target by 90% for 1 second. Wild Charge is best used near towers, be they friendly or enemy. If one or two heroes are pushing your tower, charge the more vulnerable of the two and force them to take tower damage. If pushing a tower yourself, Baldum can aggressively dive a defender and throw them into your team’s waiting arms. Wild Charge is one of the best peeling abilities, displacing the hero attacking your back line and significantly slowing them. Typically this gives the rest of your team enough time to punish them. Wild Stomp – Baldum stomps the ground, dealing 50/56/62/68/74/80 (+0.3 AD)(+0.07 armor) physical damage to enemies nearby and slowing them by 30% Enemies affected by the stomp deal 25% less physical damage to Baldum for 1 second. The cooldown of this ability is reduced by 0.3 seconds when it hits an enemy hero. Does double damage to jungle monsters.The cooldown of this ability is also reduced by 0.3 seconds every time it hits a jungle monster. The CDR on Wild Stomp is pretty significant, particularly when used on multiple enemy heroes. Using it in the midst of multiple heroes will be a big boon for your team, even if it costs your life. Wild Prison – Baldum smashes his totem into the ground, causing the ground to collapse and traps all enemies in the target area for 3 seconds, rendering them immobile. They take 400/600/800 (+0.5 AD)(+0.3 armor) physical damage and are slowed by 50% for 2 seconds after they are freed from the prison. Indomitable, Benevolence, and Bastion are standard, though the case can be made to substitute Assassinate (purple), Mythril (green), or Crusader (green). If you want to deal as much damage as possible early (if you’re going to be in the Dark Slayer lane, for instance), then Onslaught and Skewer are possibilities as well. Tanks can be used as fodder to increase cooldown reduction for Wild Stomp; otherwise, it’s best to ignore them. That said, if they’re a bit out of position, Wild Charge can serve them up on a platter for your team. Baldum can reasonably duel warriors due to Wild Stomp and the percent-based damage of Wild Charge. In team fights though, it’s best to ignore them outside of using them for Wild Stomp CDR. Baldum is one of the most effective assassin stoppers, ripping them off of your team as they dive your back line. In addition, heroes with few escape tools like Batman and Butterfly can easily be picked off if you catch them out of position. Long-range nukers and harassers are particularly annoying for Baldum, while hit-and-run heroes like The Flash and Zill can be disrupted with Wild Charge after they jump in. Otherwise, wait for them to use an ability with a cast animation so you can close the distance with Wild Charge, or aim Wild Prison at them to take them out of the fight. Similar to mages, Baldum can have a tough time with marksmen. Flicker in to pick them off, use Wild Prison on them, or use cunning and guile (ie wait for cast animations) to close the distance and charge them. For the most part, however, you’ll want to stay away despite your heavy armor. Other than their crowd control abilities and their ability to keep allies alive, supports don’t really bother Baldum too much. Like with tanks and warriors, get up nice and close to use them as Wild Stomp CDR fodder, and displace them into your team if they’re particularly out of position.